Mark Andy, DuPont Advanced Printing, and tesa tape host students from five universities at Mark Andy’s European Headquarters.On 22nd of March, Mark Andy, DuPont Advanced Printing and tesa tape co-hosted an open house dedicated to students of print-oriented technical universities from Warsaw, Lodz, and Stuttgart. 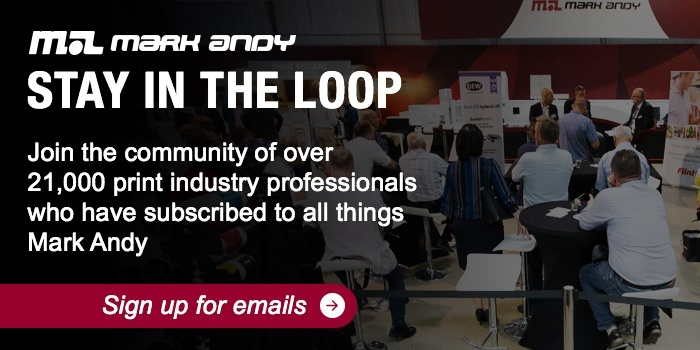 The event was held at Mark Andy’s European Headquarters in Warsaw, Poland. 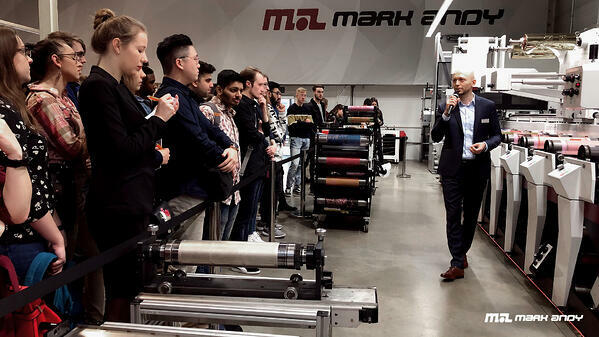 The open house attracted over 100 attendees from five universities, focused on educating students on the latest label and packaging technology, as well as the consumables that result in the highest quality print. 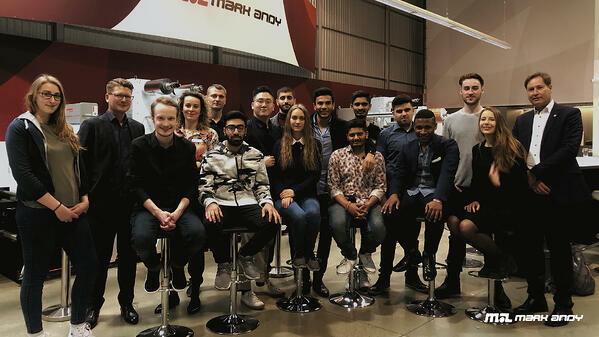 Students and their supervisors were welcomed by representatives of Mark Andy, Rotoflex, tesa tape and DuPont Advanced Printing. Throughout the event, students interacted with numerous samples printed and finished with Mark Andy’s solutions. The guests also had the opportunity to get hands-on with the equipment and ask technical questions to representatives at the event. Students witnessed demonstrations of the Performance Series P7E, featuring DuPont 45 DPR/ESX printing plates and tesa Softprint® Secure plate mounting tapes. During the demonstration, Tomasz Nojszewski, Sales Manager, DuPont Advanced Printing answered students questions concerning DuPont’s photopolymer flexo plates used in the press: 45DPR (a traditional digital plate with a round-top dot) and 45ESX (Cyrel® EASY plate with built-in flat-top-dot technology based on a patented monomer). For educational purposes, one of the plates was prepared incorrectly enabling comparison of quality differences between several samples printed with flexo technology. Tesa tape specialists, including Steffen Ebenau, International Product Manager Flexographic Tapes, tesa SE and alumnus of Stuttgart Media University, presented the company’s comprehensive tape offerings dedicated to the flexo-based printing process, including, plate mounting tape that supports high-quality printing and safe web splicing tapes. During an interactive session, students practiced plate mounting best practices using tesa’s plate mounting tape and DuPont Cyrel® plates. Students were highly interested in digital hybrid presses at the demo facility. Digital printing solutions have become more popular among printers around the globe, including an increasing number of converters in Poland. 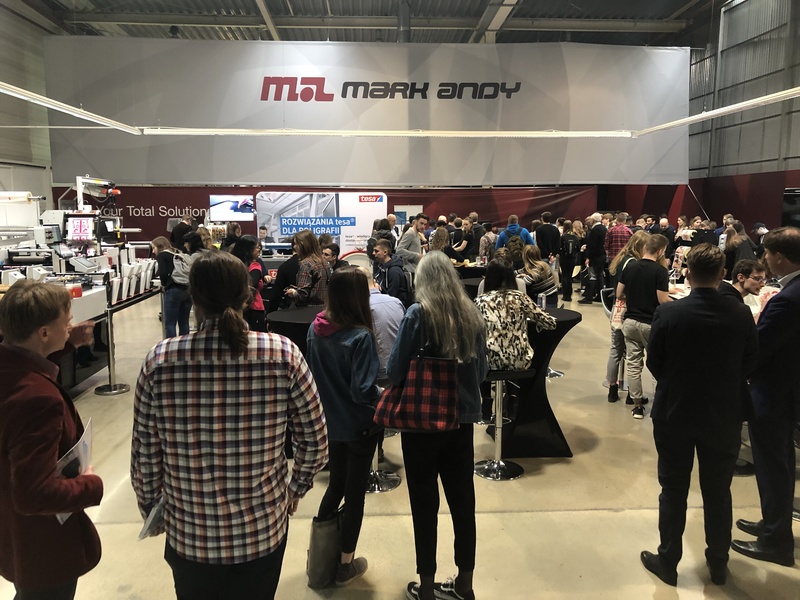 Recently, Mark Andy sold Digital Series HD press to the first Polish customer. The same company also installed several Digital One presses at their plant. The growth of digital solutions in this market supported the students’ increased interest in these advanced solutions. Prof. Volker Jansen, Supervisor of the Stuttgart Media University group, stated: “First of all, we want to thank Mark Andy for the invitation. This a great opportunity for our students to learn about the latest packaging and label printing solutions based on flexographic and inkjet technologies. 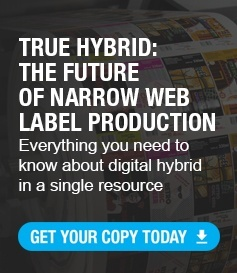 Our department was completely restructured last year, and the packaging/label market is one of the key areas we focus on. Our students were deeply interested in the demonstrated presses as well as accompanying consumables. We hope to continue to attend this type of event in the future”.